The story of the man behind Pearl Harbor and the courageous young American fliers who flew the million-to-one suicide mission that shot him down. Italy: Fascists kidnap and kill the Italian socialist leader Giacomo Matteotti in Rome. Spain: Day 329 of 985 of the Spanish Civil War. Spain: Day 694 of 985 of the Spanish Civil War. CBI - China: Day 339 of 2,987 of the 2nd Sino-Japanese War. Day 124 of 124 of the Battle of Henan. The Japanese win this province and march south to Wuhan in the Hubei province. CBI - China: Day 704 of 2,987 of the 2nd Sino-Japanese War. CBI - Mongolia: Day 31 of 129 of the Battle of Khalkhin Gol, a border dispute between the Soviet Union and Japan. USA: President Roosevelt announces a shift from neutrality to "non-belligerency" while condemning Germany and Italy and promises material aid to both Britain and France. Canada: Canada declares war on Italy. Atlantic: The Luftwaffe sinks the British armed boarding vessel HMS VANDYCK off Andenes, Norway. ETO - Norway: Day 63 of 63 of the Battle of Norway. The Norwegian 6th Division, the last Norwegian unit still actively fighting the German invasion, surrenders. Norway itself surrenders unconditionally to the Nazis, effective at midnight. ETO - France: Day 32 of 44 of the Battle of France. German troops begin to close in on Paris. Allied troops begin more evacuations on ships at St-Valery-en-Caux, Le Havre and Cherbourg. Germany: The Gestapo takes control of the Theresienstadt Fortress in occupied Czechoslovakia and begins converting it into a concentration camp. MTO - Italy: The Kingdom of Italy declares war on Britain and France, to take effect tomorrow on June 11th. East Africa: Day 1 of 537 of Italy's East African campaign in the lands south of Egypt. CBI - China: Day 1,070 of 2,987 of the 2nd Sino-Japanese War. Day 209 of 381 of the Battle of South Guangxi. Day 41 of 49 of the Battle of Yichang. Atlantic: British steamship ROYAL SCOT hits an acoustic mine and sinks in the Humber estuary on the eastern coast of England. The patrol vessel HMS PINTAIL arrives to help but also hits a mine, sinking immediately. MTO - Libya: Day 62 of 256 of the Siege of Tobruk. Middle East: Day 3 of 37 of the Battle for Syria and Lebanon. Allied troops capture several villages as they advance toward Beirut. East Africa: Day 366 of 537 of Italy's East African campaign in the lands south of Egypt. CBI - China: Day 1,435 of 2,987 of the 2nd Sino-Japanese War. PTO - Japan: Desperate for raw materials, Japanese leadership is infuriated when the US wins the contract to purchase all the Tungsten mined in Bolivia over the next three years. USA: Hollywood actress and pin-up star Hedy Lamarr and her co-inventor composer George Antheil apply for a patent on a "Secret Communication System" of frequency-hopping to guide torpedoes via radio control, an early technique for spread spectrum communications and the precursor to modern WiFi technology. 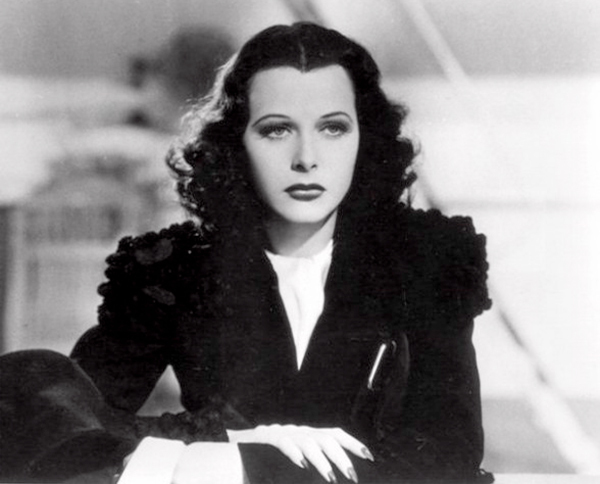 "Any girl can be glamorous," Hedy Lamarr once said. "All she has to do is stand still and look stupid." Beneath her photogenic exterior she hid a brilliant, inventive mind. In 1942, at the height of her Hollywood career, she patented a frequency-switching system for torpedo guidance that was two decades ahead of its time. This early version of frequency hopping used a piano roll to change between 88 frequencies and was intended to make radio-guided torpedoes harder for enemies to detect or jam. Although a presentation of the technique was soon made to the US Navy, it met with opposition and was not adopted. 11 Aug 42: Patent granted to Hedy Lamarr and George Antheil. Atlantic: Day 148 of 169 of Germany's Second "Happy Time," during which U-boats sink 609 Allied ships with little risk. Near Anticosti Island at the mouth of Canada's St Lawrence River, U-553 sinks the British freighter NICOYA and the Dutch freighter LETO. Germany: At Auschwitz Concentration Camp, about 50 Polish prisoners attempt to escape while working at a drainage ditch in Birkenau. In response, the SS executes 20 prisoners by firing squad and sends 300 others to the gas chambers. Czechoslovakia: The Czech town of Lidice, the 2,000 people and all buildings, is literally erased by the Nazis in reprisal for the assassination of SS leader Reinhard Heydrich. Russian Front - North: Day 276 of 872 of the Siege of Leningrad. Russian Front - North: Day 37 of 658 of the Siege of the Kholm Pocket. Russian Front - Center: Day 13 of 31 of Operation KREMLIN, a German diversion to trick the Soviets into thinking Moscow is their main objective instead of Stalingrad and the Caucasus. Russian Front - South: A massive German 33-division offensive is launched from the Kharkov region of Ukraine heading east. Russian Front - South: Day 224 of 248 of the Siege of Sevastopol, Crimean Peninsula. MTO - Libya: Day 16 of 27 of the Battle of Gazala. German and Italian troops finally capture Bir Hacheim from the Free French, who have run out of ammunition. East Africa: Day 37 of 186 of the Battle of Madagascar. CBI - China: Day 1,800 of 2,987 of the 2nd Sino-Japanese War. Day 27 of 124 of Japan's Zhejiang-Jiangxi Campaign, launched to punish anyone suspected of aiding the Doolittle raiders in China. Roughly 250,000 Chinese will be killed. PTO - Alaska: Day 4 of 435 of the Battle of Kiska, Aleutian Islands. US 11th Air Force patrol planes discover Japanese troops on Kiska and Attu. PTO - Malaya: Day 112 of 357 of the Battle of Timor Island. PTO - New Guinea: US 5th Air Force attacks the airfield and buildings at Rabaul. ETO - Germany: USAAF and RAF begin a coordinated air offensive on Germany with the RAF bombing at night and the US bombing by day. The primary objectives they have laid out are aircraft related factories and ball-bearing plants. The secondary objectives are those industrial areas associated with the above industries. Russian Front - North: Day 641 of 872 of the Siege of Leningrad. Russian Front - North: Day 402 of 658 of the Siege of the Kholm Pocket. MTO - Italy: Day 20 of 20 of the naval and aerial bombardment of Pantelleria Island. US 12th Air Force maintains all-day attacks on the island. Tomorrow the British will launch Operation CORKSCREW, the invasion of Pantelleria, only to be met by a quick surrender of the Italians. MTO - Italy: US 9th Air Force attacks targets in Sicily and on Pantelleria Island and the Reggio di Calabria Airfield in Italy. CBI - China: Day 2,165 of 2,987 of the 2nd Sino-Japanese War. US 14th Air Force attacks 10 barges and a gunboat at Chienli. PTO: Day 15 of 47 adrift in a raft for the survivors of B-24 GREEN HORNET that crashed 850 miles from Hawaii. PTO - Alaska: Day 369 of 435 of the Battle of Kiska, Aleutian Islands. US 11th Air Force attacks targets on Kiska and Little Kiska Islands. PTO - New Guinea: Day 50 of 148 of the 2nd Battle of Lae-Salamaua. US 5th and 13th Air Forces provide air support. PTO - Solomon Islands: US 13th Air Force bombs the airfield at Kahili on Bougainville Island twice during the day. ETO - France: Day 5 of 49 of Operation OVERLORD, the Allied invasion of Normandy, France, known forever simply as D-Day. D-Day+4: Allied Air Forces provide air support. The SS liquidates the town of Oradour-sur-Glane, killing all but 10 of its 652 citizens. The men are shot immediately while the women and children are rounded up and locked in a church, which is set on fire. ETO - France: Day 5 of 62 of the Battle of Caen. ETO - France: Day 5 of 25 of the Battle of Cherbourg. Within this battle begins Day 1 of 5 of the Battle of Carentan. Russian Front - Finland: Day 1 of 11 of the Battle of Vyborg. The Soviets launch a major offensive against the Finns on the Karelian Isthmus, just north of Leningrad. Russian Front - North: Day 130 of 191 of the Battle of the Narva Isthmus, Estonia. Both German and Soviet troops remain locked in their defensive positions. MTO - Greece: German SS troops massacre 218 civilians at Distomo in central Greece in revenge for losing seven of their men in a partisan ambush. MTO - Italy: Day 6 of 16 of the Battle of the Trasimene Line (north of Rome). Allied Air Forces provide air support. The Indian 4th Division takes Pescara and Chieti, while the New Zealand 2nd Division reaches Avezzano. CBI - Burma: Day 98 of 166 of the UK's Operation THURSDAY. Monsoon season bogs down all operations. CBI - Burma: Day 93 of 147 of the Battle of Myitkyina. US 10th Air Force provides air support. Monsoon season bogs down all operations. CBI - Burma: Day 71 of 302 of the Chinese Salween Offensive. US 14th Air Force provides air support. Monsoon season bogs down all operations. CBI - China: Day 2,531 of 2,987 of the 2nd Sino-Japanese War. Day 55 of 259 of Japan's Operation ICHI-GO. CBI - India: Day 95 of 118 of the Battle of Imphal-Kohima. PTO - Caroline Islands: US 7th Air Force bombs targets in the Truk Atoll and on Ponape Island during the night. PTO - New Guinea: Day 15 of 83 of the Battle of Biak. 5th Air Force provides air support. PTO - New Guinea: Day 179 of 597 of the Battle of New Britain. US 13th Air Force provides air support. PTO - New Guinea: Day 50 of 481 of the Battle of Western New Guinea. 5th Air Force provides air support. PTO - Solomon Islands: Day 223 of 295 of the Battle of the Bougainville Islands. US 13th Air Force provides air support. CBI - China: Day 2,896 of 2,987 of the 2nd Sino-Japanese War. Day 71 of 91 of the Battle of Zhijiang. US 14th Air Force provides air support. Japanese troops continue pulling out of China. PTO - Alaska: US 11th Air Force B-24s flying with US Navy bombers attack Japanese shipping and sink the NICHIEI MARU #5 off the southwest coast of Paramushiru Island, Kurile Islands. PTO - Borneo: Day 1 of 67 of the Battle of North Borneo. The Australian 9th Division makes landings at Brunei Bay. PTO - Dutch East Indies: Day 41 of 52 of the Battle of Tarakan Island. PTO - Japan: US 20th Air Force B-29s attack targets at Kasumigaura, Tomioka, Kaigan, Chiba, Ogikubu, Omiya and Tachikawa. PTO - Japan: Day 71 of 83 of the Battle of Okinawa. The destroyer USS WILLIAM D PORTER is sunk by a Japanese kamikaze. PTO - Korea: The USS FLYING FISH sinks a Japanese cargo ship off the coast of Korea in the Sea of Japan. PTO - New Guinea: Day 531 of 597 of the Battle of New Britain. US 10th Air Force provides air support. PTO - New Guinea: Day 415 of 481 of the Battle of Western New Guinea. US 10th Air Force provides air support. PTO - Philippines: Day 233 of 299 of the 2nd Battle of the Philippines, aka the Liberation of the Philippines or the Philippines Campaign. PTO - Philippines: Day 178 of 244 of the Battle of Luzon. 5th Air Force provides air support. PTO - Philippines: Day 93 of 159 of the Battle of Mindanao Island. 5th Air Force provides air support. PTO - Philippines: Day 85 of 135 of the Battle of the Visayas region. US 5th and 7th Air Forces provide air support.